And the winner is… #99 DIA! Congratulations to our winner and thanks to everyone who entered. JCPenney has released their holiday looks, available in stores and at JCP.com, and some of the outfits are super cute (check out the looks from Olsenboye above!). So we've teamed up with JCPenney to offer one lucky Budget Babe reader the chance to win a $100 gift card so you can shop these adorable looks for yourself! To enter, visit JCP.com then tell me what outfit you'd "gift" yourself to wear to all of those holiday parties or family gatherings in the comments section below. This giveaway is open to US residents only, sorry. Comments must be posted by 12 noon ET on Wednesday December 1, 2010 to be eligible to win. Winner has three business days to respond upon notification of winning the prize after which point another winner will be selected. This is not a sponsored post. One of my favorite nail polishes at the moment comes from an unlikely place: Payless! As I reported earlier, Payless has launched its own beauty line including nail polish by Unforgettable Moments. I picked up a bottle of Sugar Plum ($2.99), a deep purple polish with a classic high gloss finish, and I absolutely love it! Picture the deepest purple hue in a slice of blueberry pie, and that's the color you'll get with this polish. Thanksgiving is the perfect time to pull out those trendy harem pants you bought on a whim but never ended up wearing. Think about it: Elastic waistband, forgiving silhouette, major cool points for being a fashion "risk"! 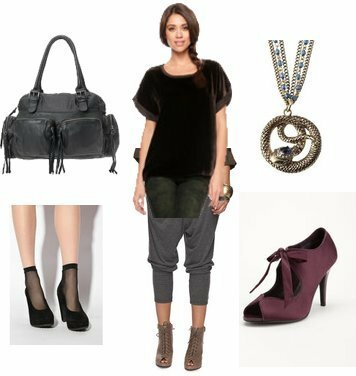 Pair your harem pants with a velvety top and some ankle boots to complete your laid-back ensemble. Another supereasy and affordable way to get glammed up for the holidays is with a chic headband, a trend that's skyrocketed since the dawn of Gossip Girl. Headbands are especially useful if you're heading to a party right after work, just slip on a sequined headband for a touch of shine and whimsy. These inexpensive hair accessories are great for keeping flyaways and rogue bangs in place, too. Target has an amazing selection, most are well under $10. My photos don't do them justice, many look better in person. Check them out in the accessories section on your next visit! Dressing up for the holidays is one of the greatest joys of the season but most of us don't have the money to overhaul our wardrobes. Fortunately, with a few key pieces, you can update things you already own and make them feel fresh and festive. First up, here's what to wear to that office holiday party. You probably already own a white blouse and black skirt. Try layering an inexpensive sequin tank (size up if necessary) over the blouse -- left casually unbuttoned, sleeves rolled up just a bit -- plus black tights and ankle boots for an entirely new look. Sophisticated yet glamorous -- and totally affordable!